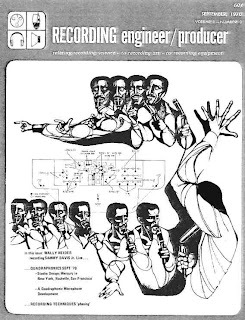 RE/P And Sammy Davis Jr.
Recording Engineer/Producer (RE/P) was perhaps the best audio production magazine ever. Way ahead of its time, RE/P began in 1967 and served the professional audio community with excellent articles during a time when the semi-pro and prosumer markets were mere trifles to the audio community. As is usually the case, founder Marty Galley sold out to a large publishing conglomerate, and within a couple of years the magazine was out of business around 1989. Still, the info in the magazine is as good today as it was way back then (although the writing is a bit rough). I'm proud to say that I was a contributing writer towards the end of the good days of the magazine. Here's an article reprint from RE/P regarding a live tracking date with Sammy Davis Jr. Even if you don't like or care about The Candyman, it's still a lot of fun to read. I get a kick out of the mics they used (lots of Sony C-37s), the 16 track console and tape machine that was such a big deal at the time, and of course, the type of magnetic recording tape they used. Here's the article on ProSound Web, entitled "Wally Heider Recording Sammy Davis Jr. Live At The Now Grove." If I can find the articles I did for RE/P (there were only a couple), I'll post them next week. Surround sound in the home is a sad story. Once I had high hopes, but now I prefer to think of it as a noble experiment with only industrial uses. I was a big proponent of 5.1 surround sound. I even worked exclusively in that side of the business (working on over 120 music DVDs for artists like The Who, Iron Maiden, Neil Young and Todd Rundgren) for 5 years and was the West Coast Bureau Chief for the now defunct Surround Professional magazine. But 4 years ago, I gave up. The consumer just didn't care about the higher quality or the sonic envelopment that surround sound provides. The "audio sculpture" that gives you such a great user experience seems to be lost on a culture that doesn't care much about quality any more. It's convenience they're after. After a big push by both the music industry and consumer electronics industry, everyone in the music business saw the writing on the wall and gave up. Reluctantly, so did I. It wasn't worth the fight any more. I went from being one of the biggest proponents of surround sound on the planet to someone who now thinks stereo is "good enough." I've even disconnected my 5.1 playback system at home. Sorry, I'm not interested. Too many heartaches, and I no longer want to take one for the team. So I have to laugh when I read about 7.1 being the next new thing in consumer electronics. In my heart and ears, I know it's a lot better than 5.1, and I know that adding yet another height channel speaker makes the sound even more realistic, but the sad fact is, the only people who want this is the audio equipment manufacturers who think they have something new to sell. Consumers had a hard time finding space for 6 speakers, so what makes you think they'll be able to find it for 8? And consumers never were able to place the surround speakers in the right place anyway. Most listening spaces don't allow it because there's always a couch or chair or wall or doorway in the way. Why do the CE manufacturers suddenly think that the typical consumer's listening room can now ideally place yet 2 more speakers? Wives hated the extra speakers and the wires connecting them. "Unsightly," "Ugly," and other similarly descriptive words and phrases were common. Don't you think they'll have some choice new ones (like "Get the hell out of the house and take your speakers with you") with the arrival of a 7.1 system? No, 7.1 was a revolution dead on arrival. Don't hope for a sudden change in the consumer's collective heart. It's just not going to happen. Let's all enjoy the 5.1, 6.1, and 7.1 (and beyond) systems at our favorite theaters, amusement parks, and war games simulators instead. Although they've not been the music delivery medium of choice for almost 30 years now, vinyl records are far from dead. In fact, their sales have increased every year for the past 5 years now. While vinyl will never make a comeback, it's certainly not going away as a new generation of listeners discovers just how good music on a record can sound and how much fun the liner notes are to read. So here's an interesting video for you die-hard collectors regarding how a vinyl record is actually made. And if you're really interested, there are two links at the end of the post that point to part 1 and 2 of 1942 film at the RCA Victor record plant. RCA Victor record plant movie - Part 1. RCA Victor record plant movie - Part 2. Dave Jackson of Musician's Cooler was kind enough to interview me again for his podcast, this time regarding my Music 3.0 Internet Music Guidebook. To hear all about the different stages of the music business, social media management, and measuring your online success, check out the podcast. Click on the podcast link right above the picture of the book. How Much Difference Does A Snare Drum Head Make? According to Ross Garfield, otherwise known as The Drum Doctor, the single most important thing that you can do to make your drums sound great is to install new heads. But which ones? There are so many to choose from, that it's really hard to tell which ones are correct for the type of music that you're playing. But we're lucky that we're living in the age of instant video, since Gear Guruz posted an excellent video comparing the sound of different snare drum heads. Don't equate the one that sounds better in this video as the best one for you though, since the sound only applies to the particular song, but do listen to the major differences between heads. If you're reading this blog, you already know how much sound makes up a large part of our lives because you're immersed in its creation in one way or another. It'll come as no surprise that the sounds we hear on a daily basis can end up having a profound influence on us, even decades down the road, so states Martin Lindstrom in an excellent post on Fastcompany.com. Lindstrom points out a few things that you probably weren't aware of (I wasn't). For instance, when the sound was removed from slot machines in Las Vegas, revenue fell by 24%, and restaurants have found that when slow music (slower than the rhythm of a heartbeat) is played, we eat slower and we eat more (wish I knew that when I owned a restaurant)! So how were the 10 most addictive sounds determined? Buyology Inc. and Elias Arts, a sound identity company in New York, wired up 50 volunteers and measured their galvanic, pupil and brainwave responses to sounds using the latest neuroscience research methods. Much of their findings were surprising, such as just how many commercial brands over the past 20 years have made their way into the world's 10 most powerful and addictive sounds, even beating some of the most familiar and comforting sounds of nature. I personally found many of the sounds on the following list a bit confusing, since I never would've guessed their influence, but others I'm sure every one will probably agree with. So here they are, divided into brand, non-branded, and a combination. If you click on the link, you'll hear the sounds.